Spend your early afternoon in the company of some of the best Hungarian delicacies, an international crowd and the beauty of the Danube panorama! 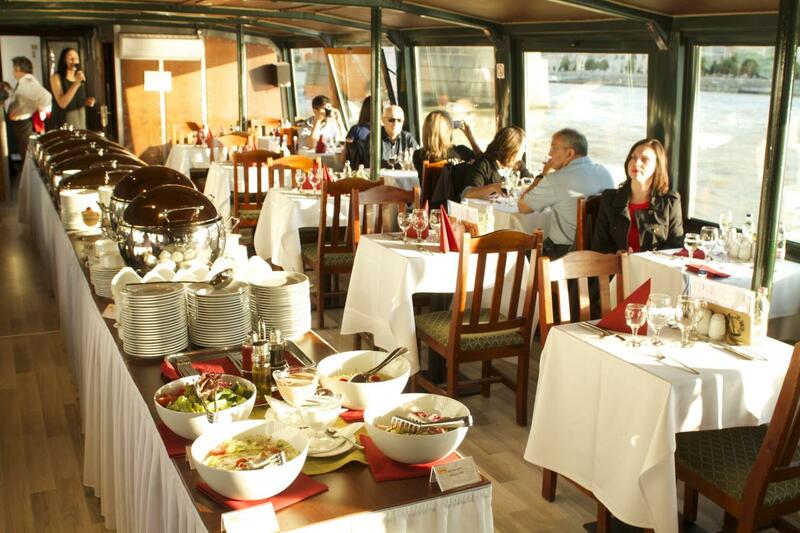 You will meet at the heart of the city with your fellow travelers and board the restaurant cruise at 2PM. Prepare for an unforgettable journey while you sail across the mighty blue river Danube. Your boat will leave from next to the Chain Bridge, the first -and some say mightiest bridge of Budapest. From here, you will start your journey on wards. Passing iconic locations such as the Hungarian Parliament, the St. Stephen’s Basilica and the Great Market Hall, your amazement will be guaranteed. Munch on the best selection of Hungarian cuisine straight out of the kitchen of Chef Peter Molnarka and enjoy the ride as you turn around ahead of the Margaret Island. Take in the view of the hilly Buda side while your boat passes them by. Sights such as the majestic Buda Castle and the Matthias Church on the top of the Castle Hill will guaranteed to take your breath away. Be careful as you sample treats from the fully packed buffet tables. You will want to leave space for the dessert as well! Throughout the 90 minutes duration of the cruise you will cross under 6 bridges of the river Danube. Taste famous Hungarian wines on board as a gratis for your ticket. If early afternoon drinking is too far out of your comfort zone, we have several soft drinks and sodas on offer as well. Don't miss the view from the top decks of the boats! Clink your glasses for the perfect start of a day in Budapest as you touch down next to the Pest side of the Chain Bridge. 3.In order you would not like to use the drop off service we are not able to provide a partial refund forthe drop off part of the service. 6.Please note: Fullfilment of last minute pick-up,drop-off requests received on the day of the program are not guaranteed and based on the available drivers. 7.Please note: In case the aforementioned conditions are not met, we are not liable to providea refund. In the case of you not showing up for the pick-up in time and missing the performance as a consequence, we will reschedule your event for a later time if are able to, but without the transfer service.If this is not a possibility or you leave Budapest,the organizer will not be able to refund money to you for any of these services.